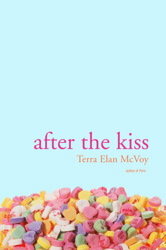 After the Kiss will be available on May 4th, 2010! Great review! I like the part about the poems. :) Looking forward to reading this in the future. Thank you so, so much for this terrific review. Once again, you really "got" this book--I LOVE that! Will be posting this on my site soon, too. Thanks, thanks, thanks--I was nervous about what you'd think! I really want to read this one, it sounds so good! Great review! I've been looking forward to this one, so I'm glad you liked it. I also love the cover.